The new Galaxy S6 and Galaxy S6 Edge have a lot going for them. But one thing that they don't have is MicroSD card slots... which is kind of a big deal, since removable storage has been a notable feature of almost every Samsung Android phone, ever. With impeccable timing, flash storage specialist SanDisk announced the world's largest MicroSD card on the same day. I can hear Samsung fans crying out in frustration all the way from Barcelona. SanDisk's 200GB Ultra® microSDXC™ UHS-I Premium Edition card holds an astonishing 200GB of storage in a standard MicroSD form factor. Before today, the largest card offered by SanDisk (or anyone else) was "just" 128GB. It's not just big, it's also fast: SanDisk rates the card at up to 90MB/s, so filling it up will only take, uh, 35 minutes... if you can find something that will let you transfer or write data that quickly. The card is designed specifically for Android phones and tablets (though the sheer size might cause problems for devices that are only expecting cards up to 64GB, even for SDXC), and SanDisk would be very much obliged if you installed their Memory Zone app to manage it. So, how much will 200GB on a thumbnail-sized slice of silicon cost you? Four hundred bucks. Ouch. That's four times the going rate of 128GB cards on Amazon, but at least you also get a 10-year warranty to go along with it. The Ultra 100GB MicroSDXC UHS-I Premium Edition will go on sale sometime in the second quarter. And in case you're wondering, the new HTC One M9 does include a MicroSD card slot. 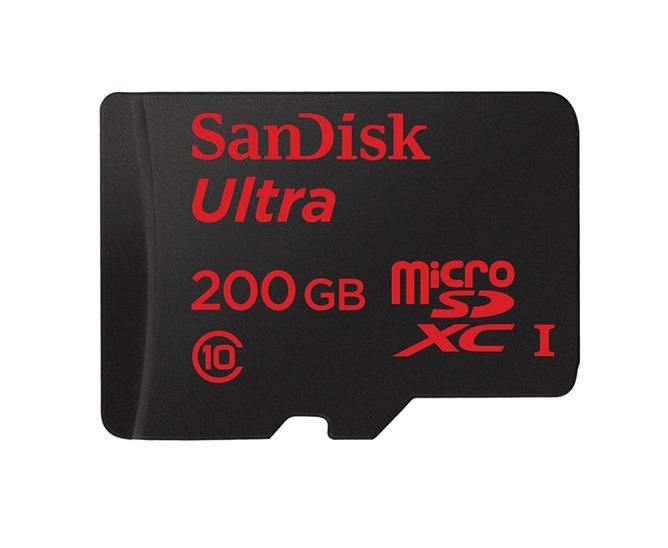 BARCELONA, Spain--(BUSINESS WIRE)--MOBILE WORLD CONGRESS - SanDisk Corporation (NASDAQ:SNDK), a global leader in flash storage solutions, today introduced the 200GB* SanDisk Ultra® microSDXC™ UHS-I card, Premium Edition, the world’s highest capacity microSD card for use in mobile devices. In just one year after introducing its record-breaking 128GB SanDisk Ultra microSDXC card, SanDisk has increased storage capacity by 56% within the same fingernail-sized form factor. Keeping up with the demands of today’s mobile users, the new card provides the freedom to capture, save and share photos, videos and other files without worrying about storage limitations. Ideal for Android™ smartphone and tablet users, this Premium Edition microSD card combines the world’s highest capacity and blazingly fast transfer speed of up to 90MB/s to deliver premium performance. At this transfer speed, consumers can expect to move up to 1,200 photos per minute2.